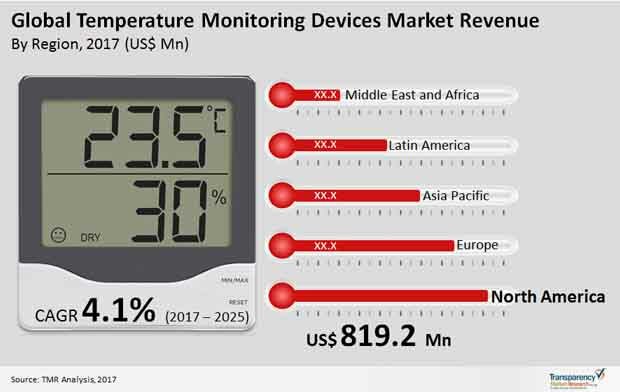 The demand in the global market for temperature monitoring devices is projected to increment at a CAGR of 4.1% during the forecast period of 2017 to 2025, gaining traction from a number of factors such as essentiality of immediate, consistent, and accurate temperature monitoring for proper treatment, advent of wearables and other technological advancements, improving healthcare infrastructure in various emerging economies, and prevalence of several chronic diseases. On the other hand, high cost of these devices and the lack of awareness in developing nations are hindering the temperature monitoring devices market from achieving its true potential. The global temperature monitoring devices market is estimated to be worth US$3.23 bn by the end of 2025, substantially up from its evaluated worth of US$2.27 bn in 2016. Based on product type, the global temperature monitoring devices market has been segmented into table top temperature monitoring devices, hand held temperature monitoring devices, temperature monitoring sensors & smart temperature patches, and wearable continuous monitoring thermometers. In 2016, the table top temperature monitoring devices segment, which is further sub-segmented into non-invasive vital signs monitoring devices and continuous core body temperature monitoring devices, accounted for the maximum share of overall demand. This dominance a reflection of factors such as high cost of alternate devices and rising awareness for continuous patient monitoring. The hand held temperature monitoring devices segment is sub-divided into digital thermometers and infra-red aural thermometers. Technique-wise, the global temperature monitoring devices market has been bifurcated into invasive and non-invasive, which is projected to dominate the demand throughout the forecast period, whereas application-wise, the market has been categorized into clinical and wellness. The wellness application segment is anticipated to increment the demand at significant growth rate in the near future, owing to constant introduction of new and innovative products from existing and emerging market players and growing adoption of these products for individual use. Based on distribution channel, the global temperature monitoring devices market is classified into institutional sales and retail sales. The institutional sales segment is further divided into hospitals, clinics, skilled nursing facilities, long term care centers, and ambulatory care centers. The growth of this segment is attributable to factors like rising awareness about patient monitoring in acute care settings, and high value low volume product offering. The retail sales segment is further classified into retail pharmacies, drug stores, and online sales. Geographically, North America continues to be the most profitable region for the vendors operating in the global temperate monitoring devices market, and is projected to experience an above average CAGR of 4.4% during the forecast period of 2017 to 2025. Some of the factors driving the North America temperate monitoring devices market are: significant adoption of wireless portable temperature monitoring devices and rising adoption of fitness tracking devices by sports industry in this region. The North America temperature monitoring devices market is estimated to be worth US$1151.8 mn by the end of 2025. Europe served the second most significant chunk of demand in the global temperature monitoring devices market in 2016. However Asia Pacific is expected to grow at a highest CAGR during the forecast period of 2017-2025, due to increasing awareness regarding remote monitoring in outpatient settings, and high patient pool having long-term pathologies that demand continuous monitoring. 3M Company, Koninklijke Philips N.V., Helen of Troy Limited, Cosinuss GmbH, Drägerwerk AG & Co. KGaA, Terumo Corporation, Omron Healthcare, Welch Allyn, Inc., Microlife Corporation, C.R. Bard, and Briggs Healthcare are some of the key companies currently operating in the global temperature monitoring devices market. Global temperature monitoring devices market is mainly driven by the rising demand for high value low volume products, and increasing innovations in the new product launches. The market is witnessing growing trend of introduction of wireless devices for remote patient monitoring, and increasing awareness for continuous monitoring is anticipated to steer the global market growth. Significant technological advancement in temperature monitoring systems for personal/home-use are likely to drive the market growth, and value added service assistance of these devices serves as major opportunity for the players operating the temperature monitoring devices space. The market overview section of the report comprises qualitative analysis of the overall temperature monitoring devices market considering the factors determining the market dynamics such as drivers, restraints and opportunities, along with Porter’s five force analysis and market attractiveness analysis. In addition, such as market opportunity analysis for the product type, technique, application, and distribution channel, and key industry developments has also been provided. Key industry developments include the major events occurred in past decade and are expected to occur during the forecast period which are likely to affect the market dynamics. The PEST analysis has also been provided U.S., Germany, and Japan market. The key technology trends has been given in the global product type section. The global temperature monitoring devices market is segmented in terms of product type, technique, application, and distribution channel. The product type segment is categorized into table top temperature monitoring devices, hand held temperature monitoring devices, wearable continuous monitoring thermometers, temperature monitoring sensors & smart temperature patches. The table top temperature monitoring devices segment is further bifurcated into non-invasive vital signs monitoring devices, and continuous core body temperature monitoring devices. The hand held temperature monitoring devices segment is sub-divided into digital thermometers, and infra-red aural thermometers. Among the product type segment, in terms of value, the table top temperature monitoring devices segment accounted for the largest share of the global temperature monitoring devices market in 2016, owing to factors like high cost of devices, and rising awareness for continuous patient monitoring. In terms of technique, global temperature monitoring devices market is divided into invasive and non-invasive. On the basis of application, the market is segmented into clinical and wellness. Based on distribution channel, the global temperature monitoring devices market is segmented into institutional sales and retail sales. The institutional sales segment is further categorized into hospitals, clinics, skilled nursing facilities, long term care centers, and ambulatory care centers. The retail sales segment is further classified into retail pharmacies, drug stores, and online sales. Geographically, the temperature monitoring devices market has been categorized into five regions namely North America, Europe, Asia-Pacific, Latin America, and the Middle East & Africa. The market size and forecast for each region has been provided for the period 2015 to 2025, in terms of product type, technique, application, and distribution channel, along with the CAGR (%) for the forecast period 2017 to 2025. The report also provides a section on the competitive landscape, wherein the market share analysis of leading players in the global temperature monitoring devices market, in terms of percentage share in 2016 has been discussed. Also, the U.S. market share analysis in terms of percentage share in 2016 has been discussed. A list of recommendations has also been included for new entrants as well as existing market players to help them establish a strong presence in the market and increase their market share. The report concludes with the profiles of major players in the global temperature monitoring devices market such as include Mediim LTD, Masimo, 3M Company, Drägerwerk AG & Co. KGaA, Cosinuss GmbH, Helen of Troy, Terumo Corporation, Welch Allyn, Inc., Omron Healthcare, Microlife Corporation, Briggs Healthcare, Koninklijke Philips N.V., and C.R. Bard, Inc., among others. The major market players are evaluated on various parameters such as company overview, financial overview, product portfolio, business strategies and recent developments.